Born Cassius Clay, the man who became Muhammad Ali defied many of boxing’s sacred teachings. 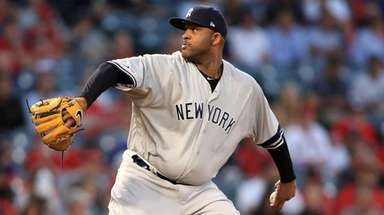 And in doing so, he revolutionized the sport and became the greatest heavyweight champion in history. Ali is many things to many people - social activist, cultural icon and the charismatic voice of the turbulent 1960s. 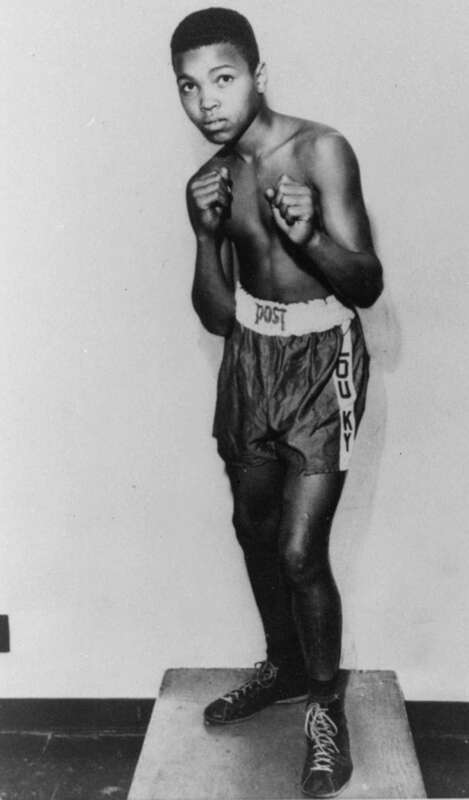 Jan. 17, 1942: Born Cassius Marcellus Clay Jr., in Louisville, Kentucky. 1954: The 12-year-old Cassius says he will whip the thief, if he catches him, who stole his new bike. Joe Martin, a Louisville policeman who teaches boxing, tells Cassius he should first learn to fight. Six weeks later Clay wins his first fight, and is directed to Louisville trainer Fred Stoner. 1954-60: Wins the Kentucky Gold Gloves championship six times, the national Golden Gloves title twice and two AAU titles. 1959: Named U.S. National Amateur Light Heavyweight Champion of the Year. 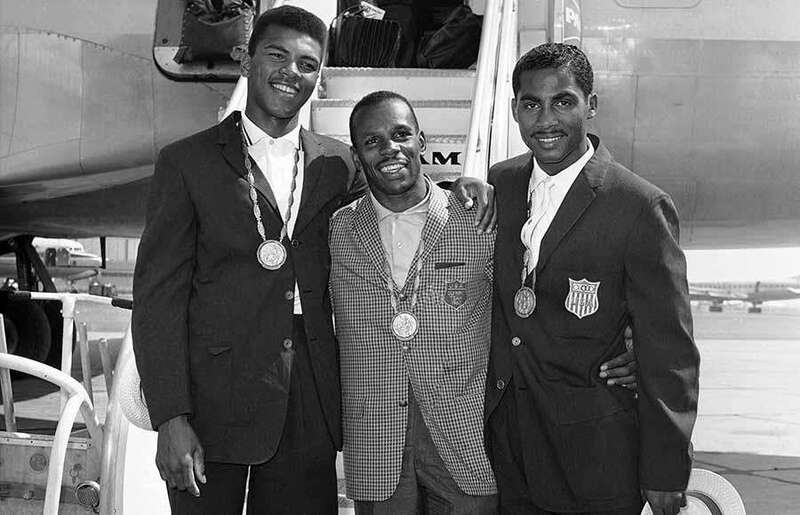 1960: Wins the light-heavyweight gold medal for the U.S. at the Rome Olympics. Oct. 26, 1960: With an amateur record of 100-5, signs with a group of 11 Louisville businessmen who launch his pro career. Oct. 29, 1960: In his pro debut, wins a six-round decision from Tunney Hunsaker in Louisville. His sponsors then send him to San Diego to be trained by legendary fighter Archie Moore, but Moore complains that Clay "won't do what I tell him to." Late 1960: Angelo Dundee becomes Clay's trainer and is with him for the rest of his career. Training headquarters moved to Miami. 1961: Clay visits a mosque in Miami, and later says it is "the first time in my life that I felt truly spiritual." April 19, 1961: His sixth pro fight is against Lamar Clark, and for the first time Clay predicts the round in which his opponent will fall. As predicted, Clark fell in round 2. 1962: Clay hears Nation of Islam leader Elijah Muhammad speak for the first time. He also meets Nation of Islam minister Malcolm X who becomes a friend and adviser. March 9, 1962: Clay is classified 1-A by his draft board, making him available to be called into the U.S. Army. But in 1964 he is reclassified 1-Y because of a low score on the Army intelligence test. September 1963: Attends a Muslim rally presided over by Elijah Muhammad. Feb. 25, 1964: In only his 19th pro fight, Clay is a 7-1 underdog, but brashly predicts that he will defeat heavyweight champion Sonny Liston. 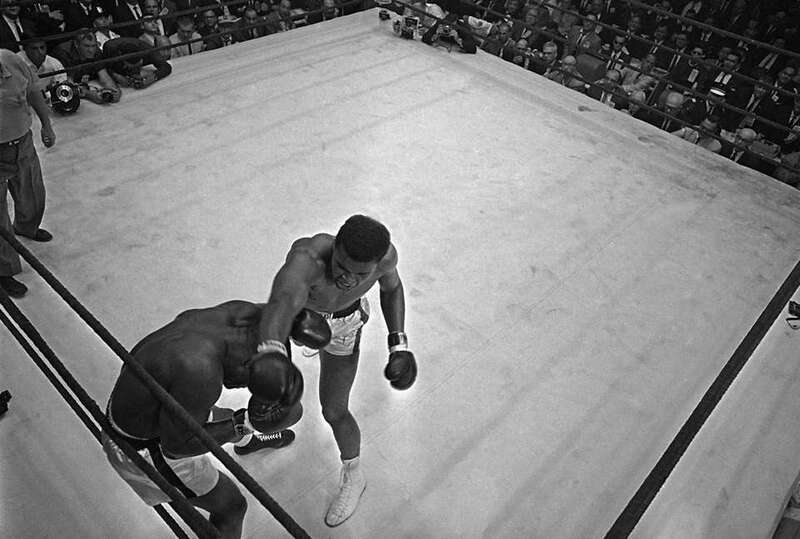 In their fight at Miami Beach, Liston refuses to answer the bell for the seventh round and Clay, 22, wins the title. Feb. 26, 1964: Responding to a reporter's question, Clay says he is a member of the Nation of Islam. He adopts the temporary name Cassius X, but on March 6 he says he has been bestowed the name Muhammad Ali, which means "Praiseworthy One." Aug. 14, 1964: He marries Sonji Roi, a former cocktail waitress. May 25, 1965: Retains the heavyweight title with a first-round KO of Liston in Lewiston, Maine. Many observers think Liston took a dive. Jan. 10, 1966: Ali and Roi divorce. Feb. 14, 1966: With the Vietnam War escalating, Army mental aptitude test score standards are lowered and Ali's draft status is changed to 1-A. Later, a U.S. Justice Department opinion denies his request for conscientious objector status. Late 1966: Ali severs ties with the Louisville management group and takes a new manager, Herbert Muhammad, a son of Elijah. March 22, 1967: Scores a seventh-round KO of Zora Folley at Madison Square Garden. He won't fight again for 3 1/2 years. April, 28, 1967: Saying, "I ain't got no quarrel with those Viet Cong,'' Ali refuses induction into the U.S. Army in Houston. He says he is a minister of the Nation of Islam. He is stripped of his title by the World Boxing Association and the New York State Athletic Commission suspends his license to fight for violating the Selective Service Act. Most other states follow suit. May 8, 1967: A federal grand jury indicts Ali for refusing to be inducted into the armed forces. June 20, 1967: An all-white jury deliberates 21 minutes and convicts Ali. 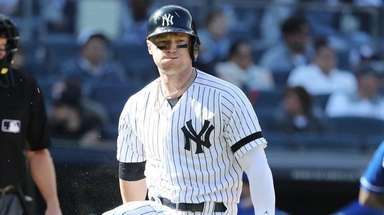 He is fined $10,000 and given the maximum sentence of five years in prison. Aug. 17, 1967: Marries Belinda Boyd, a 17-year old bride. June 1967-March 1970: Ali remains free on bail, but is barred from boxing during his appeal process. Aug. 12, 1970: Georgia, which has no state boxing commission, allows Ali to return to the ring. Sept. 28, 1970: Given boxing license by New York State Athletic Commission. Oct. 26, 1970: Ali scores a third-round TKO over Jerry Quarry in Atlanta, his first fight in 3 1/2 years. 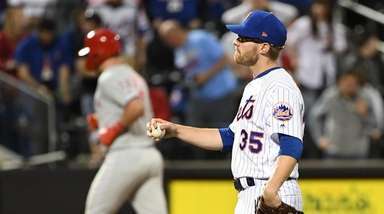 His record is now 30-0. Dec. 7, 1970: Scores 15-round KO over Oscar Bonavena at Madison Square Garden. 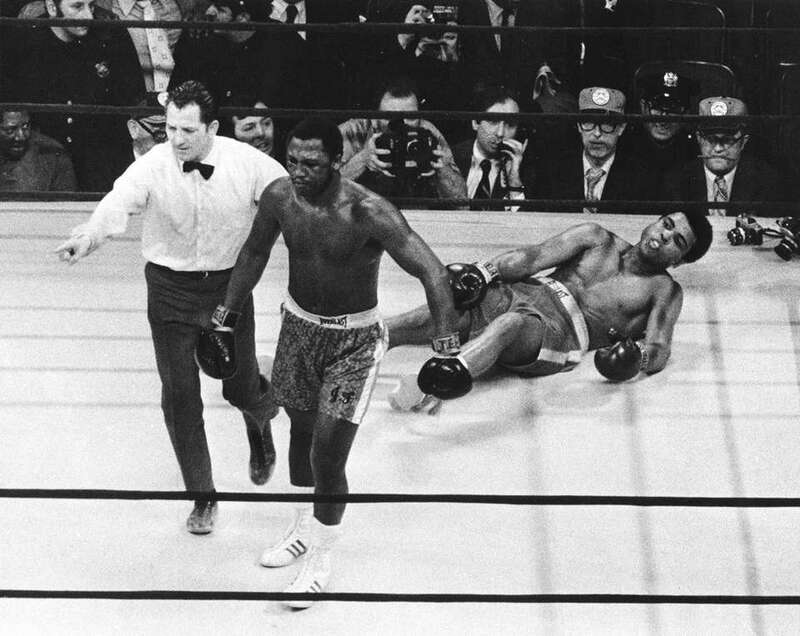 March 8, 1971: In the first of three epic bouts with Joe Frazier, Ali is knocked down in the 15th round and loses a decision at Madison Square Garden, his first professional defeat. June 28, 1971: U.S. Supreme Court unanimously overturns his 4-year-old draft conviction. March 31, 1973: In a bout against Ken Norton in San Diego, Ali suffers a broken jaw and loses a 12-round decision. Sept. 10, 1973: In the rematch against Norton in Los Angeles, Ali wins a 12-round decision. Jan. 28, 1974: In the rematch with Frazier, a non-title fight at Madison Square Garden, Ali gains a 12-round decision. 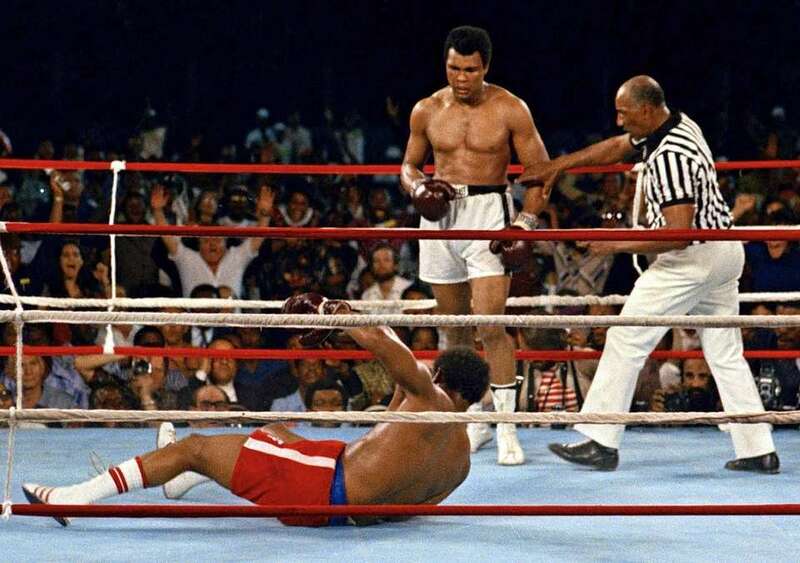 Oct. 30, 1974: Again a decided underdog in a bout billed as "The Rumble in the Jungle" in Kinshasa, Zaire, Ali springs his rope-a-dope tactics on George Foreman and wins the heavyweight title for the second time with an eighth-round KO. Oct. 1, 1975: In the third meeting with Frazier -- the "Thrilla in Manila" in the Philippines -- Ali retains the heavyweight title when Frazier fails to answer the bell for the 15th round. January, 1976: Ali divorces Belinda, who had changed her name to Khalilah. 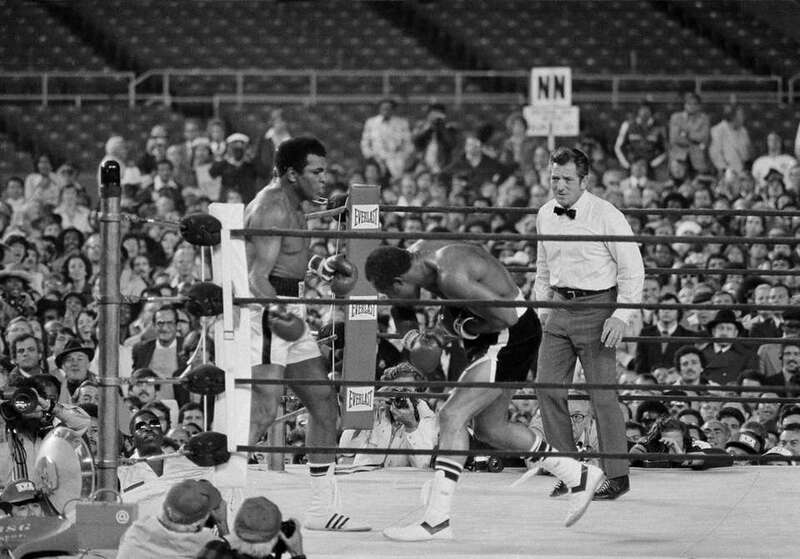 Sept. 28, 1976: A third match against Ken Norton is staged in Yankee Stadium and decided in the final round as Ali wins with a 15th-round flurry. June, 1977: Ali marries model Veronica Porche. Feb. 15, 1978: Loses the heavyweight crown to Leon Spinks on a 15-round split decision at Las Vegas. Sept. 15, 1978: Becomes heavyweight champion for the third time by gaining a 15-round decision over Spinks in New Orleans. June 27, 1979: Announces his retirement. Oct. 2, 1980: Returns for a title shot against Larry Holmes, but Holmes batters Ali, landing an estimated 125 punches in the ninth and 10th rounds alone. The fight is stopped after 11 rounds. 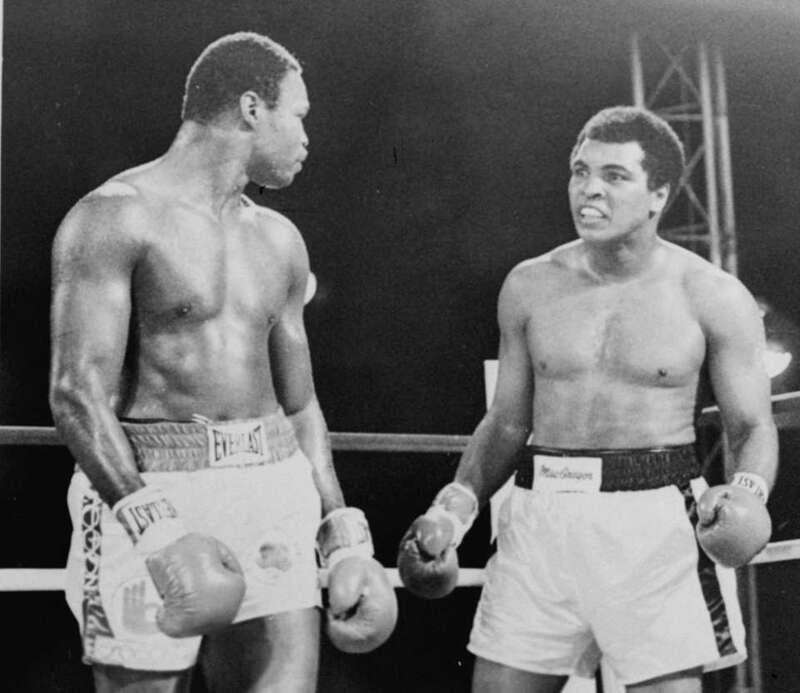 Dec. 11, 1981: Loses a 10-round unanimous decision to Trevor Berbick in Nassau, Bahamas, Ali's final fight. His record is 56-5, with 37 knockouts. 1982: Diagnosed with Parkinson's disease. 1983: Inducted into the U.S. Olympic Hall of Fame. January, 1986: Ali's divorce from Veronica becomes final. Nov. 19, 1986: Ali marries 28-year-old Yolanda "Lonnie'' Williams. 1987: Ring Magazine names Ali the greatest heavyweight champion of all time. 1990: Inducted in the International Boxing Hall of Fame. December, 1990: Secures release of 14 American hostages held in Iraq. Ali had gone to Iraq at the invitation of Saddam Hussein, who met with the former champion for 50 minutes. 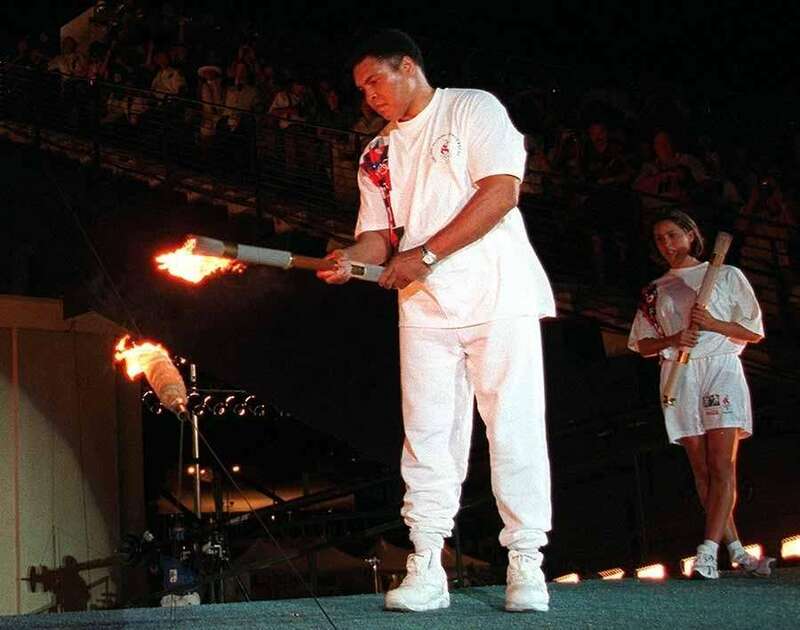 1996: In an emotional ceremony, Ali lights the cauldron at the Olympic Games in Atlanta. Dec. 4, 2001: Ali kicks off the torch relay for the 2002 Salt Lake City Winter Olympics by lighting the torch in Atlanta. Jan. 11, 2002: Has his star embedded on the wall of a theatre complex rather than Hollywood's Walk of Fame. He says, "I didn't want my star to be on the sidewalk because I didn't want anybody walking on it." Nov. 14, 2005: Awarded the Presidential Medal of Freedom, the nation's highest civilian honor, by President Bush. Nov. 19, 2005: The six-story, $80 million Muhammad Ali Center opens on Louisville's downtown riverfront. June 3, 2016: Ali died Friday at the age of 74 after respiratory complications and a 32-year battle with Parkinson's disease. Muhammad Ali dies at 74Muhammad Ali, the heavyweight champion of hyperbole and showbiz as well as prizefighting, who came to be called the most famous human on the planet, died at an undisclosed hospital in the Phoenix area. Muhammad Ali: fighter, activist, iconMuhammad Ali may be the greatest boxer of all time, but that's just a small part of the impact he made on society as a whole. From his outspoken demeanor around boxing to his political views, from his converting to Islam to his refusing to be drafted into the Vietnam War, Muhammad Ali is a transcendent cultural figure. (Newsday Staff) Muhammad Ali: A life in photos"The Greatest of All Time," Muhammad Ali transcended sports and became a once-in-a-lifetime personality. Fight of the Century: Ali vs. Frazier 1When Joe Frazier met Muhammad Ali at Madison Square Garden on March 8, 1971, the storyline went much deeper than two undefeated heavyweights clashing for the belt.